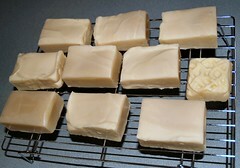 Here's a pic of my soap after taking it out of the mold. It was kinda hard to get out but it came out eventually. My bro helped me get it out.